Chic Family Travels is on a mission to find luxury family resorts that cater to children of all ages, including toddlers ages 2 and even younger! It seems like most kids clubs start at 5 years old, a select few provide for potty-trained 3 year old children, and virtually no luxury resorts provide care or kids club for children 2 years old and younger unless it is a private babysitting service. I personally prefer a daycare or kids club environment for my 2 year old toddler while I am on vacation for a couple of reasons. First of all, we are limited in how many toys we can bring on vacation, so it is a lot more fun for active toddlers to have access to additional toys during the day. Additionally, it makes me feel better for my toddler to be watched in an environment where there is more than one care-taker monitoring the children. Call me crazy, but I have seen those hidden camera videos of babysitters who mistreat precious little ones when no one else is watching. That is not to say that I will never use a private babysitting service, because I do! I just prefer the kids club environment. Especially during the day, because some of the activities we want to do with our older children are not Toddler Friendly. This is exactly why I LOVE ski vacations. Most ski resorts provide childcare for children as young as 6 months old during the day. Thus, I will begin my list with mountain resorts. 1: Mountain/Ski Resorts: Most Ski resorts provide childcare for children as young as 6 months old. Some, but not all of these ski resorts continue this service into the summer months. Some of the resorts that I found which offer this service year around are Snowmass Colorado, Vail Colorado (30 months and older), Deer Valley Utah, Breckenridge Colorado and now you get the idea. Check out the resort you want to visit and make sure they provide this service and what times of year it is offered. Most all of mountain resorts provide childcare during the ski season, but a select few offer it during the summer for children younger than 3 years old as well. We recommend One Ski Hill Place in Breckenridge during the summer. 2: Carlisle Bay Antigua : Carlise Bay is a luxury resort in Antigua. Carlisle Bay has a “Cool Kids Club” that provides care for children starting at 6 months! WOW! We give Carlisle Bay a double thumbs up for this service. The service is free for 2 years old and older and charged at an hourly rate for younger than 2 years old. The childcare is provided in the kids club and is not a private babysitting service. However, private babysitting services are provided after hours. Chic Family Travels was so impressed with Carlisle Bay that we are visiting for Thanksgiving 2012. We will post a full review of the Carlisle Bay Cool Kids Club soon! 3: Le Guanahani St Barts: Le Guanahani is a luxury resort in St Barts. Le Guanahani provides childcare starting at 2 years old and it is complimentary. Chic Family Travels loves this toddler friendly perk. We have not planned a visit to Le Guanahani but have a stay at Le Guanahani on our bucket list due to its complimentary creche for 2 year olds and older. 4: Buccament Bay St Vicents and the Grenadines: Buccament Bay in St Vincents and the Grenadines is a luxury all-inclusive resort. The Harlequin Kids Club at Buccament Bay provides child care for all ages and is included in your stay. Chic Family Travel is so impressed with Buccament Bay that we are visiting in December 2012. P.S. – This is not your typical all-inclusive. Think Ritz Carlton, not Club Med. 5: I am still researching number 5 🙂 Its not an easy task! Chic Family Travels knows that there are other resorts that provide childcare for little ones like Beaches and Club Med, but we want to stick with the luxurious, boutique, exclusive and luxury resorts that cater to multi-generational families that also understand the need the provide childcare for toddlers. Lets face it, it seems like once our kids get “easy” is when all of the luxury resorts begin to allow them to go to the kids club! Now, I still love a good kids club for the older ones. However, it is MUCH easier to find. On that note, I personally recommend the kids club at the Atlantis. The Atlantis kids club is amazing! 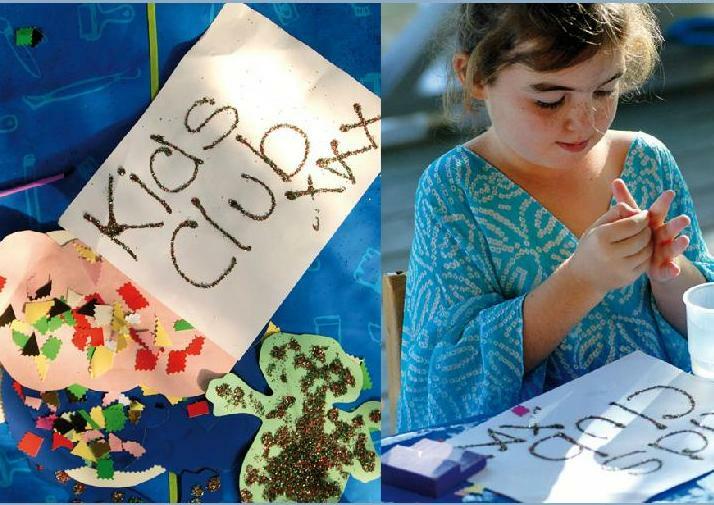 The Atlantis Kids Club is more like kids adventures and/or experiences. For Example, my children attended Casino Night and Carnival Night at the Atlantis Kids Club. The Atlantis themed kids club activities were more like a Beverly Hills birthday party, not a typical kids club activity. My 10 year old even loved it, and that is saying ALOT. However, the Atlantis does not allow children at the kids club until they are 3 years old and potty-trained. We are still impressed with this age bracket, but we are on a more difficult mission of finding care for our younger toddlers at luxury resorts. We love to spend time with our children and we travel with them to spend time with them, but there are times when a toddler is too young to participate in certain activities. For example, we often use childcare for our 2 year old to spend quality time with our older children. It is a very nice and much appreciated amenity to know that a select few luxury resorts provide care for our toddlers during those times. If any of my luxury family travel readers and followers known of other resorts that would make the list of “Best Resorts For Toddlers ages 2 and younger,” then please let Chic Family Travels know!